By choosing to construct their morale patches from durable PVC rubber, Maxpedition has made it possible to use vivid coloring and create intricate designs that can't be found anywhere else. This Fire Dragon Morale Patch is a perfect example, as well as a metaphorical tribute to our nation's heroic firefighters. 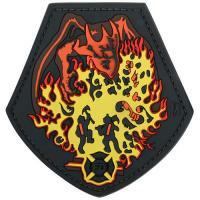 The patch is contoured to deliver a three-dimensional appearance and features bright red and yellow flames engulfing those that were brave enough to stand in the face of danger for the sake of others. The patch includes a hook-backing that attaches to any loop field, such as the ones found on many Maxpedition bags. It also comes with a separate loop field sheet that can be sewn onto apparel and other accessories for more permanent attachment, or serve to protect the back's hooks when not in use.